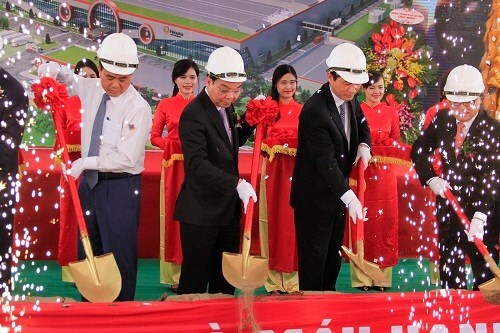 Hanoi (VNA) – A ground-breaking ceremony for Vietnam’s first aircraft engine parts factory, Hanwha Aero Engines, was held at the Hoa Lac High-tech Park in Hanoi on September 21. The nearly 97,000sq.m plant invested by Hanwha Techwin Co., Ltd from the Republic of Korea (RoK) has total investment of 200 million USD. The first facility is expected to become operational in next April and the construction of the two others will be completed in 2022. The project will generate jobs for 1,000 local labourers. Speaking at the ceremony, Minister of the Science and Technology Chu Ngoc Anh highlighted that the event is significant as the two countries are celebrating the 25th anniversary of diplomatic relations. Hanwha Techwin will create a knock-on effect, helping the Hoa Lac High-tech Park attract more foreign investors in the coming time, Anh said, adding that they will make major contributions to enhancing scientific and industrial potential in the northern region in particular and Vietnam in general. The company has recently received large orders from world’s leading aero engine producers like General Electrict, Pratt & Whitney and Roll-Royce. The Hanwha Aero Engines plant, with competitive production capacity, is expected to promote the development of Vietnam’s aero industry in the future. The Ministry of Science and Technology has ordered the management board of the Hoa Lac High-tech Park to complete the construction of basic infrastructure as well as mechanisms and policies, creating favourable conditions for investors. From the outset of the year, the board granted investment licenses to three projects with total registered capital of over 5 trillion VND (219.9 million USD) and the RoK’s aircraft engine parts plant is standout among them.